Hey, guys! My finals are like three days away and I'm going hard on studying Biology, Chemistry, Physics, Mathematics, and History. 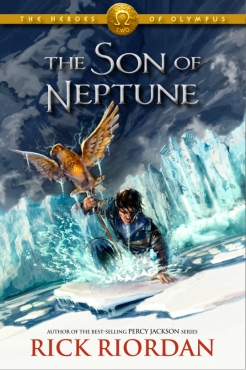 Anyway, today, I'll write my review on Rick Riordan's The Son of Neptune, the second book in the Heroes of Olympus pentalogy. And the main hero from Percy Jackson and the Olympians pentalogy is back! Percy Jackson, son of Poseidon, the god of the seas—oh wait, or is it the son of Neptune? o.O The first few chapters flow slowly (plus action and comedy in-between) before Percy reaches Camp Jupiter—apparently another demigod camp, except it was for Romans. And here I thought the Heroes of Olympus series is mostly about Greek gods. Come back by sundown on June twenty-fourth or die. And then later, Mars comes down and orders Frank, who he reveals to be his son, Hazel, and Percy to embark on a quest to free Thanatos, the Death, in Alaska and come back to Camp Jupiter before the 24th of June, which is four days away. (Really? Four days again?) Hazel is revealed to have been dead before. (1940s, specifically.) And if she freed Death, then she would be taken back into the Underworld. But if she didn't free Death, then the world is gone. Same goes for Frank, whose life is tied to a freaking wooden splinter. *shows vulgar gesture to Juno* Sacrifices to be made... gee, the dilemma is strong. "I will trample you to death, silly Chinese-Canadian baby man." Savage. This horse is savage. Best horse ever. Riordan sure knows how to make people laugh. I mean, come on, the giant Alcyoneus, bane of Pluto, humming Jingle Bells upon being unconscious? The giant Polybotes, being tricked to enrage OCD god of boundaries, Terminus, and indirectly helped Percy smack him into dust? That horse calling Frank a baby man? Damn, I wonder if Riordan had written in the comedy genre before. Anyway, all in all, this book is awesome. It shows the Roman aspect of the Heroes of Olympus series perfectly, as The Lost Hero showed Greek. I didn't expect to find so many differences between the two. Informative, comedic, suspense-filled, dilemma-filled, drama, fantasy via mythology, this book has it. Though, I'm not continuing with The Mark of Athena until I've finished Empire of Storms. I waited too long for that book. Also, since exams are in the next week, I might be seriously inactive. This has been my review of The Son of Neptune. Thank you for reading. Until then: Senatus Populusque Romanus, my friends. Next stop: The Mark of Athena.